Caring for all of the cats and kittens at the Meow House is very expensive and as a result, the bills add up quickly. Please consider donating what you can to help us provide the animals with food, medical care, toys, and so on. 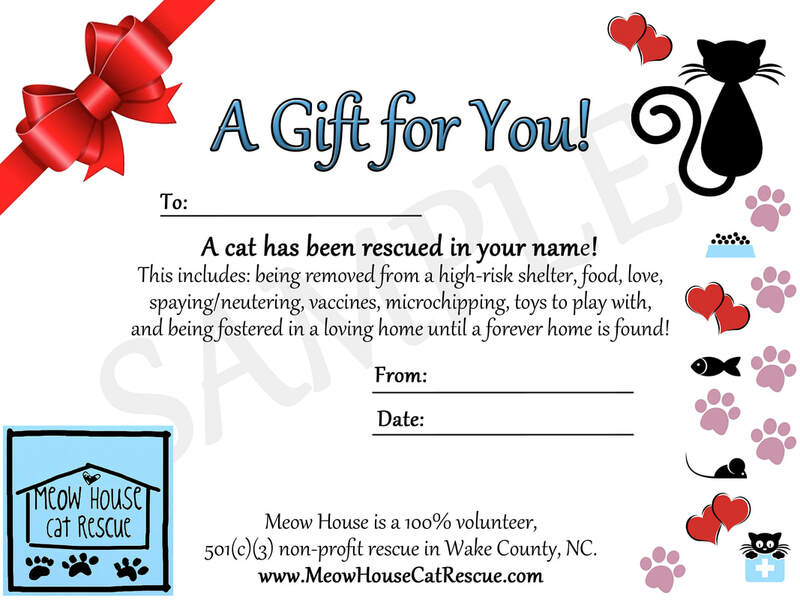 Sponsor a rescue cat as a gift! After your transaction is complete, send an email to MeowHouseCatRescue@gmail.com with the following information: Your name, recipient name, your email address, and a note letting us know whether you want us to email the certificate to you, or if you want it mailed in the postal mail to (please provide address if choosing this option.) We recommend that if choosing postal mail, you allow at least 8 days for it to be received. If choosing email, please allow at least 24 hours (it will usually be faster). You will receive an email from us, either with the certificate, or letting you know it has been mailed. If you'd like us to customize for a different occasion ("Happy Birthday" instead of "A Gift for You," or "A cat has been rescued in memory of" instead of "in your name"), please let us know and we will gladly customize! 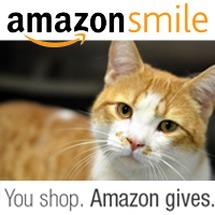 Shop at Amazon Smile: It doesn’t cost you anything extra, but Amazon donates 5% of your purchase amount to Meow House! Buy Meow House swag: We have shirts, mugs, car magnets, totes, and more! Become a ﻿Foster: We provide vet care, you provide the love! Become a Volunteer: Lots of other help is needed too. Learn how you can help. Purchase a Particular Item From the Meow House Wish List! Not only will Meow House receive the exact items needed, but Amazon will also donate 5% to Meow House! (And you don’t get charged anything extra.) Cool, huh?